In everyday usage, there is no need to specify whether a given “deliberation” is individual or collective. It may be surmised from the context whether it is a matter of an individual reflecting on what to do, or else a debate or collective reflection by members of a group with a decision to be made. In short, in everyday usage, there is no need to ascertain what collective deliberation is. But it is a pertinent question in the social sciences. Any attempt to define the notion more precisely is prone to generate perplexity, on several accounts. For it is in fact difficult to pin down the specific features of collective deliberation and delineate it in practice, and so strongly diverging ways of thinking about it have been suggested. I believe a whole series of examples may be given for which the issue of argumentation is ultimately entirely secondary […]. Political knowledge is one such example. We are dealing with a particularly committed form of knowledge which involves, at one and the same time, taking a position and professing what one believes […]. Argumentation here plays a wholly subaltern role; there might be a lot of arguing, but it is no longer argument at all, it is propaganda, because, both intellectually and emotionally, the die was cast in advance. It is not ultimately arguments that are going to enter the mind of one’s political opponent, or change their ideas1 . In politics, convictions and the pressing concern to win are said to put paid to arguments. What speakers say amounts to professing their beliefs, or propaganda. It is either wholly expressive, or else deployed to exert unconscious, non-rational influence, with the goal of converting listeners or performing a mild form of brainwashing2 . Rejecting argumentation as irrelevant is often a way of signaling political realism, sometimes backed up by a philosophy of action dissociating reasoning and decision (known as decisionism). The second stance towards the supposed requirements of argument, which has come to dominate, is unwilling to relinquish the possibility of reason swaying decisions. It pares back the conception of deliberation to a form of cooperation respecting the normative requirements of argued exchange. But then the problem is that the conditions for a strongly cooperative attitude are rarely encountered in situations where one may expect to find collective deliberation. Although these two positions are opposed, they ultimately share the idea that the possibility and relevance of deliberation presupposes cooperative, argumentative exchange. They differ on whether such exchange is possible, but concur in admitting the existence of a kind of antinomy between deliberation and a confrontation of interests or beliefs. We shall see both are wrong, and that deliberation and antagonism may in fact be reconciled. The second difficulty concerns how to delineate collective deliberation in practice. While we associate it with conducting collective reflection and debate in view of a collective decision, it is not clear there is an exact overlap between debate and reflection. Hence such basic questions as knowing when deliberation starts or where it takes place can cause difficulties. “Who wishes to give counsel?” was the question used to open the assemblies of the Athenians3 . Should we hold that collective deliberation started only with the speech by the first speaker? It is nevertheless likely that citizens had already thought before arriving in the agora, and had already discussed the questions to be decided by vote with some of their fellow citizens – reflections and discussions which may have had as much impact on their vote as what occurred solely during the assembly4 . We shall see that it is possible to delineate collective deliberation by carefully distinguishing between its heterogenous components, and considering how they fit together. ‘Althing in Session’, oil canvas by W. G. Collingwood (1854–1932). There are two bodies of scholarship about deliberation. The first tradition is that of rhetoric. To take just a few great authors as points of reference in what is an immense bibliography, Aristotle, Cicero, Quintilian, and then Perelman in the twentieth century provide one way of thinking about deliberation. But the renewed interest in deliberation since the late 1980s is attributable to scholars working in political philosophy, and then political science, who placed deliberation at the heart of a new way of thinking about democracy5 . It is because of the remarkable success of the topic of deliberative democracy that certain political scientists, sociologists, historians, and anthropologists have taken an interest in deliberation, viewed through the prism of debates by various committees and assemblies. But these two bodies of scholarship have very different ways of thinking about deliberation. While their defining criteria show some kinship, they display only partial overlap – to the point that what rhetoric may hold to be deliberative is not always so viewed by proponents of deliberative democracy, and vice versa. Thus to avoid confusion, we need either to clearly adopt the meanings of the terms used in one of the two traditions, or else set out a third course. I do not believe the latter solution necessary, and I shall explain why the rhetorical tradition goes further towards meeting the descriptive requirements of a sociology of collective deliberation. The covers of Aristotle’s Rhetoric and Jürgen Habermas’s The Theory of Communicative Action. we can say that deliberation is debate and discussion aimed at producing reasonable, well-informed opinions in which participants are willing to revise preferences in light of discussion, new information, and claims made by fellow participants. Although consensus need not be the ultimate aim of deliberation, and participants are expected to pursue their interests, an overarching interest in the legitimacy of outcomes (understood as justification to all affected) ideally characterizes deliberation10 . 5) lastly, this same sentence introduces the idea of gradated fulfilment of a requirement taken to characterize deliberation, namely the desire to reach a decision justified to all those affected. This implies that the requisite attention and sensitivity to the quality of one’s own arguments and those of others is not a given, but instead requires an effort, perhaps even a constraint, or at the very least good will. The species of rhetoric are three in number; for such is the number [of classes] to which the hearers of speeches belong. […] Now it is necessary for the hearer to be either a spectator or a judge, and [in the latter case] a judge of either past or future happenings. A member of a democratic assembly is an example of one judging about future happenings, a juryman an example of one judging the past. A spectator is concerned with the ability [of the speaker]. Thus there would necessarily be three genera of rhetorics; deliberative, judicial, demonstrative. Deliberative advice is either exhortation or dissuasion; […]. In the law court there is either accusation or defense; […]. In epideictic, there is either praise or blame. Each of these has its own “time”: for the deliberative speaker, the future (for whether exhorting or dissuading he advises about future events); for the speaker in court, the past (for he always prosecutes or defends concerning what has been done); in epideictic the present is the most important; for all speakers praise or blame in regard to existing qualities11 . Let us note the main characteristics of this definition of deliberation, while bearing in mind that provided by Simone Chambers. 1) Deliberation is not defined as a type of interaction or communication, but presented as an adjective describing a particular type of speech. Deliberative speech is speech that seeks to counsel, in other words that underpins the formation of the listener’s practical reasoning, or seeks to influence it if already formed. 2) The genre of deliberative speech is related to the type of listener concerned, namely a citizen taking part in public decisions, not a juror in a trial or a theater spectator. 3) Time is a decisive criterion in distinguishing genres of speech. Deliberation is solely about the future, which amounts to saying that deliberation only concerns decision, understood as determining an action to be undertaken, and not just any kind of affair requiring collective thought. Much stress is placed on the specificity of the object and the result of the reflection, namely action. 4) The deliberative genre occurs in two different exercises, counseling for or against undertaking an action. Aristotle tends to think of deliberation as a contradictory debate for or against. 5) Lastly, there is a remarkable effort to link – no doubt too closely – this conceptual division to the Athenian institutions, with the political assembly for deliberation, the jury in a trial for the judicial genre, and the practice of funeral oration and texts written and disseminated at the theatre for epideictic. 6) This definition does not directly set out any normative or qualitative requirements. Deliberation is defined in contrast to other types of speech, but distinguishing it never proceeds by approximation to an ideal. It must be said that for Aristotle and the rhetorical tradition as a whole, deliberation is not allocated any role in political legitimization. 7) Finally, let us note that the specific characteristics of deliberation are not susceptible to gradation. The situation is either deliberative or it is not; it cannot be deliberative to varying degrees depending on the quality of the speeches. 3) a certain type of encounter between speakers and listeners (an assembly, discussion, dialogue, or debate). These three components of collective deliberation are conceptually distinct. Reasoning, the art of convincing, and the way the debate is organized do not pertain to the same categories of analysis. We shall thus examine them one by one, before envisaging how to articulate them. It is possible to account for the main specificities and properties of deliberation qua practical reasoning by contrasting it to two other activities. First, while practical reason englobes instrumental rationality, the two are not the same thing. Second, deliberation is not assessment, even though all deliberation includes an assessment aspect13 . The reason why the term deliberation only appeared in the social sciences thirty-odd years ago is because it did not previously have any place in the study of decision-making. Decision-making was of interest primarily to disciplines such as economics, the sociology of organizations, management studies, and political science, in which a strictly instrumental concept of rationality prevails. According to this way of thinking, action is said to be rational because it results from a choice, with the option selected being that deemed best suited to attaining the goal of the action. Instrumental rationality consists in choosing a means – the action – with a view to an end. Instrumental rationality is of course a central aspect of human, and even animal rationality, but it does not cover the whole spectrum of practical rationality. There has in fact been a close link between growing appreciation for the concept of deliberation and expanding ways of thinking about rationality in terms other than an instrumental relationship between means and ends. As we shall now see, from the perspective of the sociology of decision-making, with the famous case of the Cuban missile crisis. In 1962 the US government obtained proof that the Soviet Union was installing offensive missiles on Cuba. The US president, John F. Kennedy, acting in great secrecy, convened the Executive Committee of the National Security Council (ExComm), comprising fifteen top security officials and the president’s closest advisers. This committee, which met for several days running, was tasked with collectively putting forward options and arguments to decide on the US reaction to the presence of offensive missiles capable of reaching the US coast in minutes. President Kennedy, who attended most of the meetings, insisted they take place in a climate facilitating discussion of all positions. On October 22, 1962 he publicly announced the presence of the missiles, demanded that the Soviet Union withdraw them, and announced a naval blockade of Cuba forbidding any ship involved in the continued installation of missiles to approach the island. 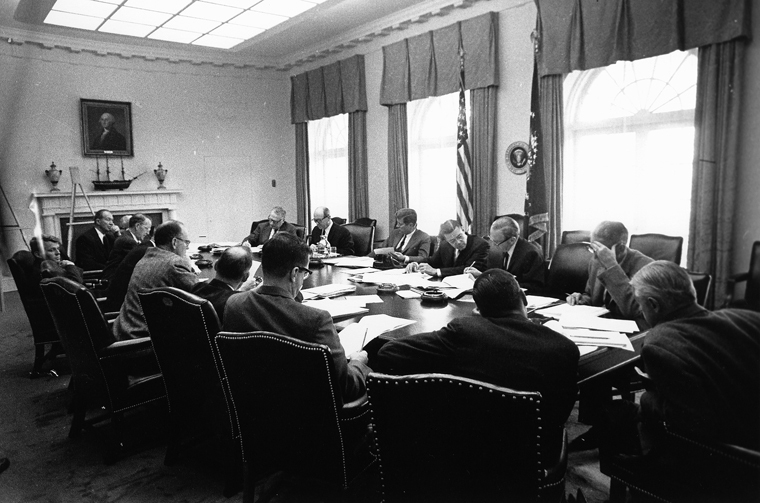 EXCOMM cabinet meeting at the White House during the Cuban missile crisis, October 29, 1962. One of the questions raised by researchers specializing in international relations is: how did the president and his entourage come to prefer the naval blockade to the other options envisaged, namely massive bombardment backed up by invasion of the island, surgical bombardment without invasion, inaction, diplomatic protest, or secret negotiations with Fidel Castro? In what has become a classic book, Graham Allison put forward three different answers following three different analytic models14 . Working with the first model, the choice of a blockade looked rational when compared to the other options assessed in the light of US government interests in facing the Soviet Union and its ally, Cuba. The second model emphasized the impact of organizational routines – especially the army’s – in shaping options and their relative merits. Finally, the third model highlighted how sectoral concerns and the balance of power and influence between committee members impacted on advocating the option Kennedy finally selected. 7) ensuring that the US reaction confirmed US naval superiority worldwide. Yet during the first meeting only one single objective was mentioned, namely displaying US determination. Objectives 2, 3, 4, and 5 were only mentioned during subsequent meetings. Thus the second goal – not launching a surprise attack on a small nation, with the idea that it would contradict the US image at home and abroad – was introduced to the debate only subsequently (by Robert Kennedy, the president’s brother and minister of justice), in objection to the option of massive bombardment of the missile installations, an option which, by the end of the first meeting, seemed to have majority backing. But on the other hand, Anderson did not unearth any mention of the sixth and seventh goals or objectives, and suggests they were evoked only afterwards. This example shows that the rationality at work in collective reflection to determine a decision is not limited to operationalization, going from ends to means, and to rationalization, attributing reasons or ends to an action once it has been adopted. Starting from one of several goals, necessarily posited at the beginning of the reflection, examination of various actions with the status of means leads to the discovery of new ends. Next, these newly mentioned ends in turn refine the comparison of alternatives, encouraging participants to look for new options. In deliberation, reflection on means elicits reflection on ends. It is mistaken to believe that one cannot deliberate on ends on the grounds that they are necessarily posited prior to the examination of means. At least one goal does have to be posited from the outset, but when envisaging the actions to be undertaken, participants may be led to wonder if the goal pursued is valid, if other ends do not merit consideration, and whether the previously posited goal ought to be examined from an entirely different angle. Deliberation combines examination of alternative options with work to specify the ends pursued17 . In addition to this, it is important to understand that practical reasoning must not be assimilated to assessing. Present research into the notion of deliberative democracy pays little attention to the specificity of the reasoning involved in deliberation. A noted article by Philip Pettit provides a clear illustration18 . He imagines the case of a workers’ cooperative in which the employees have to collectively decide whether or not the company should buy a safety device against a risk of electrocution to which their work exposes them. He imagines the employees confer to establish a list of questions to which they must all reply individually to reach an opinion about the right decision to take. They settle on three. Is there a real danger of electrocution? Is the safety device effective? Is it affordable? For an employee to vote in favor of purchasing the device, he must reply in the affirmative to each of these three questions. This imaginary case is a good example of deliberation thought of in terms of assessment, or in fact here the sum of three assessments. But assessment does not determine action. What are the employees to do should they consider that there is real danger of electrocution and that the safety device is too expensive? Should they settle for not buying the safety device? This brings out how the answers determine the conclusion of an assessment, which asserts what is desirable or undesirable, but do not thereby determine the action to perform. Yet the goal of practical reasoning is precisely to determine what is to be done to solve a problem. As Aristotle powerfully asserted, the conclusion of practical reasoning is action19 . It is not the assessment of action. It is perhaps preferable not to buy the device, but assessment of the alternative purchase/not purchase is insufficient to determine what the employees are to do in the face of this danger. The non-deliberative nature of the example was already present in the main question the members of the workers’ cooperative were meant to ask: should we buy the safety device or not? This question relates to the assessment of one means to solve a problem among others. But the real deliberative question is an entirely different one: what are we to do if there is a proven risk of electrocution? Curiously, Pettit places assessing the danger, the quality of the device, and the possibility of absorbing its cost all on the same level. The conjunctive structural logic thereby dilutes the real difficulty of all deliberation, which resides in confronting several incommensurable goods: I want to solve a safety problem, but assessment of the cost of the device leads me to wonder what I am prepared to sacrifice for my safety and that of my colleagues. This takes us back to the exercise in specifying ends: initially the employees have only one end to consider, safety at work, but examining the means leads them to ask what they are prepared to accept to obtain this safety. A second example may illustrate another aspect of the difference between assessment and deliberation. Imagine a committee of experts in charge of assessing other people’s activity and performance. Suppose that at some stage they enquire into how their assessments are used, and find, for example, that they are a factor in deciding whether or not to promote those assessed. Also suppose that they come to hold that the consequences of their assessments (promotion decisions) are their concern, and that they have opinions on the ends that these promotion decisions ought to respect. They may then anticipate the use that will be made of their assessments, and formulate them in such a way that the probable consequences fit the ends they hold they should pursue. In this case, their assessing is embedded in (and in the service of) deliberation about promotions. Initially, their assessing took place within a division of labor in which committee members need not concern themselves with how their appraisals are used. They merely provide information then used to make promotion decisions, but their activity is disconnected from the ends associated with these promotions. After their change in attitude, they become agents of these promotions, because the assessments they produce are partly guided by the ends they henceforth associate to promotions and hence to their assessments. An assessment is not an action, in that it alone does not transform anything. This statement suggests we need to unpack what we mean by action. It is useful to distinguish between action and mere activity. Action is here thought of as the transformation of a patient undergoing action produced by an agent: for example, the person deciding on promotions alters the status of those appraised and affects them in various ways (either maintaining them in their job or changing it, resulting in satisfaction or disappointment). In itself, the assessment (which is not disclosed to the person assessed, and not yet used in deciding promotions) is merely an activity, affecting no one. There is an agent, but no patient. It should be noted that the assessment becomes part of a deliberation once the assessors become interested in the ends of the promotions, and thereby become agents within these promotions. Sarah Broadie has pointed out that Aristotelian practical reasoning places three terms in relation to each other: the agent, the action as means, and the agent’s ends. This differs from the dominant view of rational choice, which only considers two terms, the agent, identified to his preferences or ends, and the action as means20 . Assessment is binary, but deliberation ternary. The habitual binary conception of rational choice conceives of actors as assessors, whose ends or preferences make it possible to rank and select the available options. The ternary conception takes into account the fact that the actor or agent reasons about his ends, emphasizing that deliberation calls for the agent to broaden their point of view. There are two extreme positions on the capacity of discourse to change our opinion when we are deciding what we should do. The first holds that persuasion is rare, even though human beings are forever arguing to defend their opinions and convince their fellow men. The second fears the power of persuasion, and is quick to portray it as a form of violence. The first thinks rhetoric pointless, the second condemns it. Both are wrong for the same reason, as they fail to see that the power of deliberative discourse is anchored in the very nature of human action. Marc Angenot has devoted an entire book to the failure of rhetoric. He argues that individuals are very rarely convinced to abandon an opinion to which they were previously attached21 . Though this observation is correct, it does not hold good in all circumstances, and is incapable of validating the hypothesis that persuasion is doomed to failure. It is indeed true in many domains. For instance, you will never see a politician, scholar, or ideologue who, after having listened to their rivals, adopts the position, theory, or ideas they have just argued against. And more generally, two antagonists in a controversy will not manage to convince each other. The first reason for this is psychological. Anyone sure enough of their convictions to take the trouble to defend them in public is voluntarily opinionated. The second reason is more fundamental, for it pertains to the object of discourse. Examples of obduracy often pertain to intellectual systems whose overall coherence makes it easy to parry objections, be it for oneself or others. But when it is a matter of arriving at a precise idea of what is to be done in a given situation, and the decision to be taken concerns everyone, then the particularities of the given affair diminish the sway exerted by overarching frameworks of reference. And if the various options under consideration are not too clearly unequal in quality, then while those championing these options will generally not change their opinion, some of the listeners who did not yet have a fixed opinion may be swayed one way or the other. Habermas’s philosophy and most of the theories it inspires accept the idea of the power of discourse. But they think of it as being of two opposing kinds. On the one hand, they reject rhetoric, regarded as the art of misleading and a form of violence. On the other, they hope that another power of discourse will prevail, famously described as “the forceless force of the better argument”22 . Admitting there might be such a thing as a “better argument” is meant to prompt a convergence of opinions, for it is admitted that the participants all respect the same rules of rational dialogue, namely concern for the truth of the propositions put forward, normative justice, and sincerity. These preconditions for the power of discourse to be licit may well be desirable, and it is possible to impose rules of conduct (professional ones, for example) allowing us to hope they be met. But the social sciences cannot presuppose they are always or even commonly met in situations of collective decision-making, without running the risk of being sharply contradicted by empirical observation. Unlike these two positions, rhetoric takes the power of discourse to stem from what listeners expect. Those looking to forge their opinion so as to partake in the decision expect the speakers to provide arguments and information likely to feed, guide, or sway their reflection. All this stems from the nature of the specific object under deliberation, namely action. Aristotle states this on several occasions: one does not deliberate about what is perfectly known, invariable, or wholly determined, nor about what is completely unforeseeable. Rather, one deliberates about what depends on us while being partially indeterminate23 . It is important to distinguish between what is indeterminate, what is uncertain, and what is probable (in the modern sense of probability calculus). The uncertain supposes knowledge of events or causal relations, but incomplete knowledge about the likelihood that they occur. Probability calculus requires one knows the full gamut of possible events and the likelihood they occur. The indeterminate relates to a situation in which the events and causal relations that are likely to come into play after the action one wishes to take are not (all) known. They can be imagined at best. This indeterminate nature of the future is compounded by the difficulty in arbitrating between several ends or goods, mentioned earlier in our examination of practical reasoning. As these ends or goods are incommensurable, arbitration cannot be settled by calculation, but rather by argumentation. While conviction and interest may well determine the practical judgement of some of the members of the deliberating body, this will not necessarily be true of all. Those whose opinion is not yet formed or fixed will inspect what speakers have to say for arguments likely to help them determine, test, or confirm their judgement. The fundamental indetermination of its object, together with the necessarily argumentative arbitration between the ends pursued, has an impact on the nature of deliberative discourse: there is no validity criterion. It is not possible to ensure that the option proposed is the best possible option, or the least bad of those envisaged. It is this absence of criterion that is the hallmark of argumentation and rhetoric, far more than recourse to passion or any agonistic dimension of discourse. The peculiarity of the evidence of mathematical truths is, that all the argument is on one side. There are no objections, and no answers to objections. […] But when we turn to subjects infinitely more complicated, to morals, religion, politics, social relations, and the business of life, three-fourths of the arguments for every disputed opinion consist in dispelling the appearances which favor some opinion different from it25 . A good speaker not only knows how to plead in favor of the option he wants adopted, but also how to answer objections and thereby take into account opinions opposed to his own26 . Third, the absence of a fixed point also dictates the correct way to treat the question of sincerity and concern for truth that lie at the heart of contemporary conceptions of deliberation. Once the absence of a validity criterion is recognized, then while good faith may be claimed or asserted, it cannot be proven or detected with confidence. What may be proven is bad faith. It is a matter of empirical proof – a document, testimony, or misstep will expose it27 . It is not possible to guarantee the sincerity of speakers – not even in situations where there is no a priori indication that the speakers are seeking to defend a preestablished point of view. The only real protection against bad faith, bad reasoning, and ill-intentioned attempts to manipulate is the rhetorical quality of the opposing discourse. Certain institutional mechanisms may also be partially effective in monitoring deceit, inappropriate arguments, or poorly formed judgements. For instance, systematically holding carefully formatted contradictory debates28 , or checking that factual or causal statements are valid (like the fact-checking recently introduced by the press in several countries). But none of these mechanisms can make up for the absence of a good and well-intentioned speaker. is not to persuade but to see the available means of persuasion in each case, as is true also in all the other arts; for neither is it the function of medicine to create health but to promote this as much as possible; for it is nevertheless possible to treat well those who cannot recover health31 . This means that a well-intentioned speaker will not defend option B on the sole grounds that it has a greater chance of pleasing the electorate and winning him their votes. Rather, he will defend option A because he judges it better for the group concerned, and will seek among the various aspects of option A (as well as among its rival options) those which are most likely to bear convincing arguments in favor of this option. That is also why sincere discourse is not an exact antidote to ill-intentioned discourse. The orator who defends an option because he judges it best will not necessarily privilege the reasons or aspects of the option which, to his mind, best justify his preference. In his speech he may privilege other reasons or aspects, which he deems valid though of lesser relevance, because they strike him as more persuasive for his audience. The great authors in the rhetorical tradition, whilst being conscious of this instrumental nature, and of its possible misuse, have mainly followed Quintilian in defining rhetoric as the art of speaking well of what is right. But this does not necessarily imply full and complete sincerity. Debate may be thought of as an organized encounter between two activities: speaking and listening. This organization is severely constrained by an economy determined by the scarcity of certain goods, here the scarcity of time and the limit to people’s capacity for attention. In this economy of debating, the size of the group determines how it is organized. The way the debate is organized must then factor in how the stakes of the decision may impact on the relationships between participants. As Bertrand de Jouvenel has humorously shown, unless the time of a meeting is prolonged indefinitely, and everybody is attributed an improbable capacity for attention, the number of those who may speak at sufficient length to express an opinion is necessarily limited32 . Let n be the number of participants, each of whom is granted the same speaking time, let m be the duration of the meeting, and k the minimal time necessary to set out an argument, answer objections, and object to other speeches. The equation k=m/n describes the relationship between these three parameters. It may be seen that once the number of participants exceeds twenty, if the allotted speaking time is respected, this entails an implausible hypothesis about the listeners’ capacity to sustain their attention. There is another factor significantly shaping the way the debate is organized, namely the stakes of the decision. The way debate is organized tends to differ depending on whether an assembly or committee is to take decisions that tend to arouse antagonism amongst its members or, on the contrary, have no negative effect on their wish to cooperate. In the event of frequent conflicts, the jousting needs to be regulated, while for cases of habitual cooperation, an ethics or deontology of discussion will suffice. Taking into account the shortage of time and the cooperative or antagonistic nature of debate leads to consideration of two different models distributed by group size and the stakes of decisions, namely the oratorical model and the discussion model. The discussion model is symmetrical, cooperative, fragile, and places strong requirements on participants. It is symmetrical in that all participants in the deliberation are there to speak, and thus have a good chance of so doing. All have a dual role, as speaker and listener. They seek to convince each other. The minimum setup for the discussion model is a dialogue, in which two speakers, moved by a common concern to reach a good decision, exchange arguments, correct each other, and together discover what seems to them to be the best option. It is cooperative and places normative requirements. The participants seek to collectively reach the best possible decision. They are not meant to defend a position at any cost just because it suits their interests or convictions33 . Each tries to convince, but is just as disposed to being convinced. Discussion is a collective reflection benefiting from the objections, corrections, and improvements of each participant. The participants are contributors shaping the best solution, rather than defenders of pre-established positions. It is possible and probable even that at the end of the discussion not everyone will be of the same opinion, and a vote will be needed to rank them. In this case, the majority result does not designate winners and losers, but the most convincing option. Lastly, the discussion model is fragile in that the stability conditions for its constitutive characteristics are not spontaneously and lastingly established. Should institutional safeguards or vigilance fall short, it is quite likely that the collective deliberation situation will change, and no longer display the constitutive aspects of the discussion model. For argument to prevail in shaping individual opinions and designating the selected option, the participants must not only be competent, but also sincere and free of duplicity. It is only possible if no member abuses their superior status or competence to impose their point of view. The oratorical model is, for its part, asymmetrical, agonistic, robust, and places few normative requirements. It is asymmetrical in that not all participants in the deliberation speak; though all are entitled to do so, only some of them address the rest of the assembly in their role as listeners. The speakers do not hope to convince each other, but seek rather to persuade the other members of the assembly that the position they are defending is the best one. Speakers and listeners partake in the decision following the debate, but the result is in the hands of non-speakers, who outnumber speakers. The speakers oppose one another, but the listeners decide. The minimal setup for the oratorical model is triangular, with two speakers in front of one listener. Furthermore, the oratorical model is agonistic, with minimal normative requirements. The speakers defend a point of view, so it is not surprising that their speech has instrumental intent tending towards effective persuasion34 . Each speaker seeks victory for his position. What matters to him is that enough listeners, whose opinions are not yet fully formed, may be convinced, thus swinging the vote in favor of the option he is supporting. The competitive nature of this model of deliberation is accompanied by a loosening of the moral requisites. While the speakers’ sincerity may be valued, it is not required. This should not to be attributed to some kind of cynicism or amoralism attendant upon accepting competition. The oratorical model may give rise to the instrumentalization of discourse, and the condemnation of this35 , just as democracy permits and condemns demagogy. The normative requirements of the oratorical model are weak because sincerity is not a constitutive characteristic. Discussion being cooperative, it is imperiled by insincerity. But this does not harm the integrity of the oratorical model, since listeners seeking to form their opinion need not bother about the sincerity of speakers (except if they are using false information) or whether they are disinterested. All that matters for these listeners is the confrontation of arguments, among which they will identify those which seem most convincing to them, and which will carry greater weight in shaping their opinion. Consequently the oratorical model is robust. It is less easily corrupted than the discussion model because it comes with lesser requirements. It can more readily handle insincerity and differing levels of competence. Nevertheless, it has two necessary and sufficient conditions: 1) at least two speakers are needed who oppose one another and, if only one option is envisaged, at least one advocating for it and one against it; 2) there must be listeners who do not yet have a fixed opinion or who are capable of changing their opinion, and they must be sufficient in number to alter the decision. The oratorical model and discussion model thus differ in the distribution of speaking and listening, in operating along cooperative or agonistic lines, in their attendant normative requirements, and in their robustness. These two models are both familiar and simple. They are familiar because deliberation is instigated and may be apprehended by instituted schemas which allocate roles and expectations. They are simple because they are primarily defined by two characteristics: one relating to morphology (the distribution of speech), the other to their mode (cooperation or competition), where these two largely dictate the two properties mentioned above, namely requirements and robustness. Of course, these two models do not exhaust the various possible configurations, especially as the two may be combined. Nothing prevents the deliberations of a committee being at times symmetrical, at others asymmetrical, on occasions cooperative, and at others agonistic. A great variety of hybrid cases may be imagined by modulating the two main characteristics of these two models of deliberation. The purpose of the two models is not intended to establish a sharp partition within deliberation situations. But modes and morphologies may be analyzed in hybrid cases to detect phases where one dominates the other. To close this point, let us look at the distribution of these two models in various types of known deliberating instances. Given the economic and normative constraints, the size of the deliberating body is a key factor shaping the form of debate. The larger the group, the less likely it is to use the discussion model for deliberations. The discussion model is inappropriate for most assemblies, political or otherwise, which tend to follow the oratorical form. Furthermore, a modest size is a necessary but not sufficient condition for discussion. Small groups have a better chance of following the discussion model if they have undergone certain forms of institutional fashioning pertaining to the selection of members, their independence, and rules of argumentation. Such an effort is most frequently made when the decisions to be taken require specific competence. What is collective about collective deliberation? What lessons may we draw from our examination of these three components – practical reasoning, counsel, and debate – at work in collective deliberation? First, they would often appear to be linked, but not necessarily associated. Thus someone cognizant of the agenda of a meeting during which a collective decision is to be taken may very well have an idea of what it is desirable to decide, prior to having benefited from the collective discussion. Thus in practice the formation of practical reason does not necessarily coincide spatially and temporally with the debate. Furthermore, proffering counsel is not the preserve of the deliberating groups. It may involve one or several advisers for a single decision-maker acting as sole deliberating agent. Lastly, a debate, taken broadly as an event in which speakers and listeners come into contact, is not necessarily deliberative. It is not deliberative when the stake does not consist in determining what action to take, but, for example, examining what is fair, or the value of a work of art or any other type of undertaking. The various ways in which these three components may be articulated explains the difficulty observers may encounter in seeking to delineate collective deliberation. When does it start? Where exactly does it take place? The answers to these two questions are easy if collective deliberation is limited to debate, as most works on deliberative democracy do. But this restriction runs contrary to the primacy accorded to practical reasoning in defining any deliberative activity. Remember that what makes an attempt to convince someone counsel, and a debate deliberative, is that they seek to shape some such practical reasoning. It is easy to situate a debate in space and time, but it is only one moment when the participants in the collective decision counter and influence one another. The debate never absorbs all the factors and sequences in the formation of the participants’ practical reasons. It is not rare for comments heard during small gatherings, asides, or informal conversations to have greater influence on a deliberating body than those uttered in plenary sessions. Furthermore, the effect and impact of a debate differ from one individual to another. The formation of practical judgement follows courses in which the function and importance of the speeches heard vary widely. So we face two difficulties. If the emphasis is placed on the “formation of practical reasoning” component, the collective deliberation becomes hard to pinpoint; and if collective deliberation is restricted to the debate, a fair share of the factors underpinning the formation of individual practical reasons drops from view. Perhaps the solution consists in specifying what is collective about collective deliberation. This does not initially simplify things, for the term “collective” has varying meanings, all of which can apply to deliberation. First, it may have a distributive meaning. In this case, the collective nature of the deliberation pertains to the fact that all the participants in the collective decision must deliberate individually. Each must reason for their own account in order to determine how to vote. This is apparently how the ancient Greeks conceived of deliberation by the assembled demos. The term was restricted to designating the practical reasoning of each citizen when listening to speeches, which were not strictly speaking part of the deliberation36 . Then deliberation may be said to be collective in terms of what it targets. Participants in the collective decision do not deliberate about some personal matter, but about the action of the group to which they belong. Lastly, deliberation may be collective in the sense that it comprises interactions between all of those involved, both speakers and listeners. These interactions may precede the debate(s), but the latter are clearly the deliberate organization of an encounter between those who speak and those who listen. Finally, the various ways in which deliberation is collective sheds light on the articulation between practical reasoning, counsel, and debate. The expected outcome of the process is that each participant arrives at their own practical judgement. But as the purpose of this practical reasoning is the action of the group, it is important that steps be taken to expose all to the same range of speeches and opposing arguments in particular37 . Thus even though collective deliberation should not be reduced to debate, debate is necessary, for since all reflect on the same subject, it is desirable that all be exposed to the same minimal diversity of counsel and confrontation of opinions. We can now return to the antinomy that causes difficulties for contemporary thought about collective deliberation, unable to devise a way to reconcile respect for the normative requirement of attending to arguments with the conflict between interests and convictions. An extract from The History of the Peloponnese War presents the aspects of collective deliberation needed to dissolve this false antinomy. It is part of the debate in the Athenian assembly, partly narrated and partly invented by Thucydides, about the fate the citizens of Athens should reserve for the Mytilenians who betrayed them. A first assembly decided to execute all the men and enslave all the women and all the children. After Athenians voiced regrets, the assembly is summoned a second time to re-examine this verdict. Two orators and two discourses clash head on. Cleon condemns re-opening deliberation and reproaches the Athenians with a love of fine phrases, while the Mytilenians’ wrongdoing is calling out for swift revenge. Diodotus, who is in favor of reviewing the prior decision, answers Cleon and opens his speech with a defense of deliberation. As for the argument that speech ought not to be the exponent of action, the man who uses it must be either senseless or interested: senseless if he believes it possible to treat of the uncertain future through any other medium; interested if, wishing to carry a disgraceful measure and doubting his ability to speak well in a bad cause, he thinks to frighten opponents and hearers by well-aimed calumny38 . This captures the nub of the matter in just a few lines. First, the opposition between opponents and listeners spares us the antinomy enjoining us to choose between decisionism (argument is pointless) and rationalism (reason determines decision). The speakers will not manage to convince one another, but that is not what is at stake. They oppose one another and have little chance of acting in good faith towards one another, but their reasons are aimed at the listeners, primarily those whose opinion is not yet completely fixed. Cover of The History of the Peloponnese War by Thucydides (5th century B.C.). Next, deliberation is necessary to shed light on the action to be undertaken, because anticipating the future is a laborious task with no guarantee. Cleon believes that what is at stake in the decision is a matter of justice, here vindictive justice: the Mytilenians have betrayed them, they must be punished. The past, already determined, must directly entail the present decision, following the judicial mode. It is notable that he invites the Athenians to compress time, to “recall as nearly as possible the moment of suffering”39 . His error consists in believing that a decision based on the demand for justice is what best serves Athens. Diodotus, on the contrary, who has no doubt about the guilt of the Mytilenians, invites his listeners to accept the exercise in deliberation, in other words to forge their decision while bearing in mind the future of the city. The deliberative and the judicial do not coincide. Cleon wrongly thinks that “the claims of justice and expediency can both be satisfied”40 . For Diodotus, as for Cleon, a fair punishment, proportionate to the wrongdoing, is, in compliance with their norms, massacring all the men from the erring city. But less severe punishment – only the leaders will be sentenced to death – is more useful to the city, for it sends a signal that coincides with Athens’ interests. Rebel cities must be able to hope they can efface their wrongdoing by returning to their initial loyalty, and those in a city who are hostile to rebelling against Athens must be able to hope for recompense. Lastly, collective deliberation is about the action of the city or any other group considered by its members to form a whole. The idea of action calls forth the idea of good action. What the members of a group want for their group after reflection must be such that it may to their minds be described as good or right41 . While it seems unlikely that the forms of goodness or rightness are limitless or purely subjective, it is unsurprising that they differ among the members of a given group. If one part of a group views an action or end as good, it will readily arrive at the conclusion that those advocating a different action or pursuing another end are proffering poor counsel. It is thus normal that collective deliberation may at times resemble verbal jousting. One of the purposes of rhetoric, for that matter, is to equip us to counter poor counsel42 . Anyone who, like Cleon, wishes to restrict the exercise of deliberation may rightly be suspected of supporting a questionable position. A group with a decision to take therefore does not have to choose between antagonism or exercising reason; collective deliberation provides the privileged way of articulating the two. DOI : https://doi.org/10.26095/1fze-kn69 (version française). This reaction was part of a discussion in 1959 following a presentation by Perelman about the social frameworks to argumentation, Cf. Chaïm Perelman, Rhétoriques, Bruxelles, Editions de l’Université de Bruxelles, 1989, p. 368. Anatol Rapoport, Fights, Games, and Debates, University of Michigan Press, Ann Arbor, 1960. This would be the correct translation of the opening formula, not "who wishes to speak?" as is often stated, Cf. Josiah Ober, Mass and Elite in Democratic Athens, Princeton, Princeton University Press, 1989, p. 133. Robert Goodin, Simon Niemeyer, “When Does Deliberation Begin? Internal Reflection versus Public Discussion in Deliberative Democracy”, Political Studies, 2003, Vol. 51, p. 627-649. For a presentation and a discussion of this current of thought, see Antonio Florida, From Participation to Deliberation. A Critical genealogy of Deliberative Democracy, Colcherster, ECPR Press, 2017. Drawing on Theory of Communicative Action, translated by T. A. McCarthy, Boston, Mass, Beacon Press, 1984, and on "Discourse Ethics: Notes on a Program of Philosophical Justification" in J. Habermas, Moral Consciousness and Communicative Action, translated by C. Lenhardt and S. Weber Nicholsen, Cambridge, Mass, MIT Press, 1986. Among the works inspiring the emergence of the topic of deliberative democracy, those which provided a descriptive model of deliberation drew on that previously put forward by Habermas, with the exception of Bernard Manin whom pioneer article "On Legitimacy and Political Deliberation", Political Theory, Vol. 15, No. 3, 1987, pp. 338-368, is inspired by Aristotle and clearly rejects Habermas’ model. See for example André Bächtiger, Simon Niemeyer, Michael Neblo, Marco R. Steenbergen, Jürg Steiner, "Disentangling Diversity in Deliberative Democracy: Competing Theories, Their Blind Spots and Complementaries", Journal of Political Philosophy, Vol. 18, n°1, 2010, p. 32-63. And particularly her book Reasonable Democracy. Jürgen Habermas and the Politics of Discourse, Ithaca, Cornell University Press, 1996. Simone Chambers, “Deliberative Democratic Theory”, Annual Review of Political Science, 2003, 6, p. 309. Aristotle, On Rhetoric, translated by George A. Kennedy, Oxford, Oxford University Press, 1991, p. 47-48, 1358a35-1358b20, L. 1, chap. 3. I specify "issuing from Habermas’s thought" because he introduced communication and discussion as vectors for universalizing practical judgement. For Habermas, practical reason has primacy. This priority is not found in the works of political science that took their inspiration from his philosophy. I here present only some of Elizabeth Anscombe’s insights into the originality and importance of Aristotle's theory of practical reasoning, in her book Intention, Harvard University Press, 2000 . For a fuller presentation that is particularly clear on the topic of practical rationality, see Vincent Descombes, Le raisonnement de l’ours, Paris, Seuil, 2007. Graham Allison, The Essence of Decision. Explaining the Cuban Missile Crisis, Boston, Little, Brown and Company, 1971. Stephen D. Krasner, "Are Bureaucracies Important? (Or Allison Wonderland) ", Foreign Policy, n° 7, 1972, p. 159‑179. Paul A. Anderson, “Decision Making by Objection and the Cuban Missile Crisis”, Administrative Science Quaterly, n° 28, 1983, p. 201‑222. David Wiggins, “Deliberation and Practical Reason”, Needs, Values, Truth, Oxford, Clarendon Press, 1998, p. 215-237. Philip Pettit, “Deliberative Democracy and the Discursive Dilemma”, Philosophical Issues, 2001, Vol. 11, p. 268‑299. Aristotle, The Nicomachean Ethics, translated by D. Ross, Oxford, Oxford University Press, 2009, 1112b25. Sarah Broadie, Ethics with Aristotle, Oxford, Oxford University Press, 1991, p. 180. Marc Angenot, Dialogue de sourds. Traité de rhétorique antilogique, Paris, Mille et Une Nuits, 2008. In which they are perpetuating a quarrel within the history of rhetoric, see Francis Goyet, Le sublime du « lieu commun ». L’invention rhétorique dans l’Antiquité et à la Renaissance, Paris, Honoré Champion, 1996, and his introduction to Longin, Traité du sublime, Trad. Boileau, Paris, Librairie Générale Française, 1995, p. 5‑60. Aristotle, The Nicomachean Ethics, translated by D. Ross, Oxford, Oxford University Press, 2009, III, 5, 1112ba and b. “What is characteristic of the adherence of minds is its variable intensity: nothing constrains us to limit our study to a particular degree of adherence characterized by self-evidence, and nothing permits us to consider a priorithe degrees of adherence to a thesis as proportional to its probability and to identify self-evidence with truth.”, Chaïm Perelman, Lucie Olbrechts-Tyteca, The New Rhetoric: A Treatise on Argumentation, Notre Dame, Indiana,University of Notre Dame, 2008, p. 4. John Stuart Mill, On liberty, in On liberty and other writings, ed. By Stefan Collini, Cambridge, Cambridge University Press, 1989, p. 38. For discussion of the importance of anticipating objections and taking them into account, see Francis Goyet, « La forme d’un discours de phronimos » in F. Callegaro, J. Xie, Le social en commun. Dialogues avec Vincent Descombes, Classiques Garnier, to be published in 2019. As indicated by the title of Anderson’s article on the Cuban missile crisis, “Decision-making by objection”, the naval blockade was selected not because it was supposed to solve the problems under consideration, but because it did not raise the objections working against the other options, cf. ref. 16. Chaïm Perelman, Lucie Olbrechts-Tyteca, The New Rethoric: A Treatise on Argumentation, Notre Dame, Indiana, University of Notre Dame, 2008. Such as those envisaged by Bernard Manin, "Political Deliberation and the Adversarial Principle", Daedalus, Vol. 146, Issue 3, Summer 2017, p. 39-50. For an opposing way of thinking, see Jürg Steiner, "Truthfulness in Deliberation", The Foundations of Deliberative Democracy, Chap. 7, Cambridge, Cambridge University Press, 2012. Jeremy Bentham, The Book of Fallacies, The Collected Works of Jeremy Bentham, ed. Philip Schofield, Oxford, Oxford University Press, 2015. Aristotle, On Rhetoric, translated by George A. Kennedy, Oxford, Oxford University Press, 1991, p. 35, 1355b, L. 1, chap. 1. Bertrand de Jouvenel, "Seminar Exercise.The Chairman’s Problem", American Political Science Review, June 1961, vol. LV, n°2, p. 368‑372. Interests here understood as being distinct from those of the deliberating group or of the population represented by the deliberating group. Though as we have seen varying degrees of tension distinguish the two types of rhetoric. The contrast between valuing sincerity and condemning the instrumental procedure is intrinsic to arguing for others, Cf. Chaïm Perelman, Lucie Olbrechts-Tyteca, The New Rhetoric: A Treatise on Argumentation, Notre Dame, Indiana, University of Notre Dame, 2008, § 96, "Rhetoric as a Process". See the interesting study by Daniela Cammack, “Deliberation in Ancient Greek Assemblies”, to be published in Classical Philology. For discussion of the importance of being exposed to opposing arguments, see Bernard Manin, "Political Deliberation and the Adversarial Principle", Daedalus, Vol. 146, Issue 3, Summer 2017, p. 39-50. Thucydides, History of the Peloponnesian War, L. III, XLII, ed. M. I. Finely, translation by R. Warner, London, Penguin, 1972 . Thucydides, History of the Peloponnesian War, L. III, XL, ed. M. I. Finely, translation by R. Warner, London, Penguin, 1972 . Thucydides, op. cit., L. III, XLVII. See the analysis in Louis Bodin, « Diodote contre Cléon. Quelques aperçus sur la dialectique de Thucydide », Revue des études anciennes, 1940, 42, p. 36‑52. E. Anscombe, Intention, Harvard University Press, 2000 . Aristotle, On Rhetoric, translated by George A. Kennedy, Oxford, Oxford University Press, 1991, 1355a 20-25, L. I, chap. 1. Paul A. Anderson, “Decision Making by Objection and the Cuban Missile Crisis”, Administrative Science Quaterly, n° 28, 1983, p. 201-222. Elizabeth Anscombe, Intention, Harvard University Press, 2000 . Aristote, On Rhetoric, translated by George A. Kennedy, Oxford, University Press, 1991, p. 47-48, 1358a35-1358b20, L. 1, Chap. 3. Aristote, On Sophistical Refutations, translated by E. S. Forster, D.J. Furley, Boston, Mass, Harvard University Press, 1955. Aristotle, The Nicomachean Ethics, translated by D. Ross, Oxford University Press, 2009, III, 5, 1112a and b.
André Bächtiger, Simon Niemeyer, Michael Neblo, Marco R. Steenbergen, Jürg Steiner, “Disentangling Diversity in Deliberative Democracy: Competing Theories, Their Blind Spots and Complementaries”, Journal of Political Philosophy, vol. 18, n°1, 2010, p. 32-63. 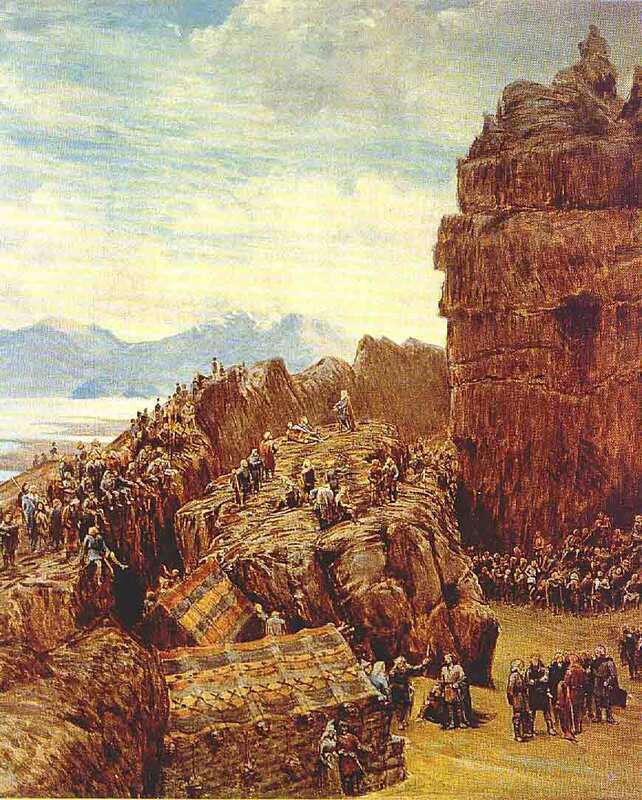 Louis Bodin, « Diodote contre Cléon. Quelques aperçus sur la dialectique de Thucydide », Revue des études anciennes, 1940, 42, p. 36-52. Sarah Broadie, Ethics with Aristotle, Oxford, Oxford University Press, 1991. Daniela Cammack, "Deliberation in Ancient Greek Assemblies", à paraître dans Classical Philology. Simone Chambers, Reasonable Democracy. Jürgen Habermas and the Politics of Discourse, Ithaca, Cornell University Press, 1996. Simone Chambers, “Deliberative Democratic Theory”, Annual Review of Political Science, 2003, Vol. 6, p. 309. Vincent Descombes, Le raisonnement de l’ours et autres essais de philosophie pratique, Paris, Seuil, 2007. Antonio Florida, From Participation to Deliberation. A Critical genealogy of Deliberative Democracy, Colcherster, ECPR Press, 2017. Robert Goodin, Simon Niemeyer, “When Does Deliberation Begin? Internal Reflection versus Public Discussion in Deliberative Democracy”, in Political Studies, 2003, vol. 51, p. 627-649. Francis Goyet, Le sublime du « lieu commun ». L’invention rhétorique dans l’Antiquité et à la Renaissance, rééd. Paris, Classiques Garnier, 2018. Francis Goyet, Traité du sublime, Trad. Boileau, Paris, Librairie Générale Française, 1995, p. 5-60. Francis Goyet, « La forme d’un discours de phronimos » in F. Callegaro, J. Xie, Le social en commun. Dialogues avec Vincent Descombes, Classiques Garnier, to be published in 2019. Jürgen Habermas, “Discourse Ethics: Notes on a Program of Philosophical Justification”, in Moral Consciousness and Communicative Action, translated by C. Lenhardt, S. Weber, Nicholsen, Cambridge, Mass, MIT Press, 1986. Jürgen Habermas, Moral Consciousness and Communicative Action, translated by C. Lenhardt and S. Weber Nicholsen, Cambridge, Mass, MIT Press, 1986. Bertrand de Jouvenel, “Seminar Exercice. The Chairman’s Problem”, in American Political Science Review, June 1961, vol. LV, n°2, p. 368-372. Stephen D. Krasner, “Are Bureaucracies Important? (Or Allison Wonderland)”, in Foreign Policy, n° 7, 1972, p. 159-179. Bernard Manin, "Political Deliberation and the Adversarial Principle", Daedalus, Vol. 146, Issue 3, Summer 2017, p. 39-50. John Stuart Mill, On Liberty and Other Writings, Ed. by Stefan Collini, Cambridge, Cambridge University Press, 1989, p.38. Josiah Ober, Mass and Elite in Democratic Athens, Princeton, Princeton University Press, 1989. Chaïm Perelman, Rhétoriques, Bruxelles, Editions de l’Université de Bruxelles, 1989. Chaïm Perelman, Lucie Olbrechts-Tyteca, The New Rhetoric: A Treatise on Argumentation, Notre Dame, Indiana, University of Notre Dame, 2008, p. 4. Philip Pettit, “Deliberative Democracy and the Discursive Dilemma”, in Philosophical Issues, 2001, Vol. 11, p. 268-299. Jürg Steiner, “Truthfulness in Deliberation", The Foundations of Deliberative Democracy, Cambridge, Cambridge University Press, 2012, chap. 7. Thucydides, History of the Peloponnesian War, L, III, XL, ed. M.I. Finely, translation by R. Warner, London, Penguin, 1972 . Thucydides, Histories of Peloponnesian War, L. III, XLII, ed. M.I. Finely, translation by R. Warner, London, Penguin, 1972 . Thucydides, Histories of Peloponnesian War, L. III, XLVII, ed. M.I. Finely, translation by R. Warner, London, Penguin, 1972 . David Wiggins, "Deliberation and Practical Reason", Needs, Values, Truth, Oxford, Clarendon Press, 1998, p. 215-237.